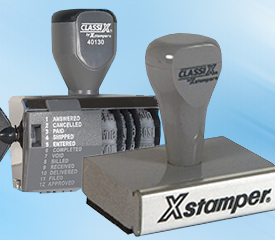 ClassiX Traditional custom stamps come in a full range of sizes and shapes to meet your requirements. Mount width will be adjusted according to copy. They are economically priced to accommodate every budget. Stamp pads are available in red, black, blue, green, purple or un-inked. Refill stamp pad ink is also available. 10-Year Dater - Recommended Uses: Date/Message Stamping. Stamp Pad Required. 10-Year Dater - Recommended Uses: Date/Message Stamping. Stamp Pad is Required. 10-Year Date Stamp - Recommended Uses: Date/Message Stamping. Stamp Pad Required. Recommended Uses: Small Message Stamping. Stamp Pad Required. Recommended Uses: Small Return Address, Small Message Stamping. Stamp Pad Required. Recommended Uses: Return Address, Message Stamping. Stamp Pad Required. Recommended Uses: Large Return Address, Large Message Stamping. Stamp Pad Required. Recommended Uses: Large Message Stamping. Stamp Pad Required.